The MuScreen platform is the only high throughput in vivo screen to evaluate immune modulating agents across preselected panels of well-characterized syngeneic and tumor homograft (MuPrime™) models. This screen provides a cost effective and time efficient way to fast-track in vivo preclinical immunotherapy development. Choose between 6 or 12 well-characterized syngeneic models to evaluate your I/O compound efficacy or PD effect. 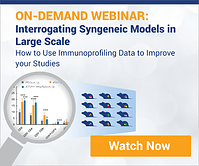 Syngeneic models display immune heterogeneity and diversity observed in the clinic, enabling comprehensive evaluation of efficacy and PD effects of your immune modulating agents. Tumor homografts are transplants of spontaneous or carcinogen-induced GEMM tumors in immunocompetent syngeneic hosts. They preserve the original GEMM tumor molecular and histopathology as well as clinically relevant oncogenic driver mutations. OurMuPrime tumor homografts have been developed to broaden the number and molecular pathology of preclinical syngeneic models for in vivo pharmacology studies. MuScreen Efficacy and PD Mode are run following a preset schedule along with a shared vehicle group. The main study endpoint for the efficacy mode is TGI with optional terminal FACS and IHC. The main PD mode endpoint is FACS analysis of tumor infiltrating lymphocytes and tumor associated macrophages at selected time points. Additional endpoints include cytokine panel profiling in blood and tumor, IHC for biomarker analysis on tumor tissues, blood cells, lymph nodes, and spleen cells. The PD mode is currently available only in the 12 model syngeneic panel. Frozen or fixed tumors are available on request in both modes. 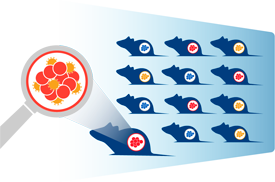 Find the best models for the preclinical evaluation of your immuno-oncology agent by logging on to CrownBio’s searchable database of well-characterized and validated mouse models. 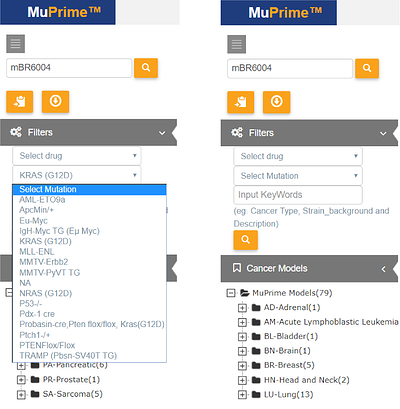 CrownBio offers a wide selection of murine research models including syngeneic, tumor homograft (MuPrime), GEMM, and humanized drug target (HuGEMM) models to screen your compounds of interest. 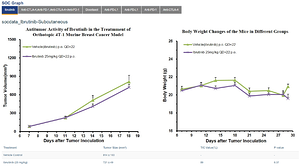 Access MuBase to explore genomic, molecular, and phenotypic data including tumor growth curves, standard of care response, histopathology data, and immune cell profiling data on this wide collection of immuno-oncology mouse models.